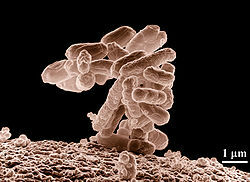 This entry was posted in Chain of life, Cooperating and competing, Surviving and thriving and tagged bacteria, health. Bookmark the permalink. While I have heard of this procedure before, I have never considered the fact that people could be “stool donors.” It tickles the elementary sense of humor that I try so hard to suppress. The fact that we have more bacteria cells than human ones floored me. It floored me too when I first read it. Humans cells–nerve, muscle, etc–are all much bigger, though. Thanks for the comment. I too found this topic “fascinating” 🙂 Great minds…..
You got some interesting comments on your post! Thanks for yours here.